A very special Shape in architecture. 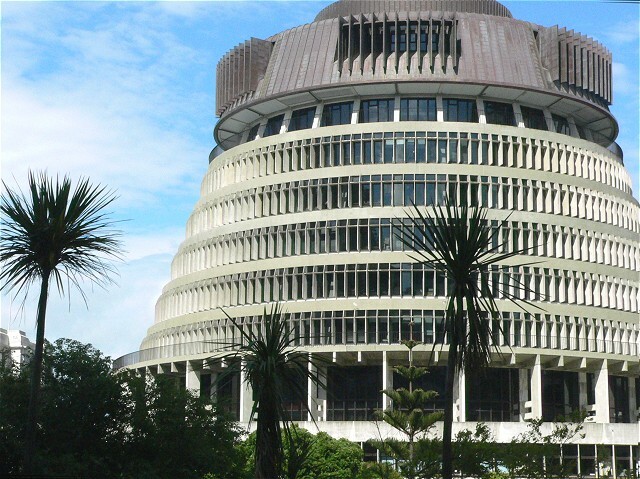 This is the Executive Wing of the New Zealand Houses of Parliament. Designed by Sir Basil Spence and built in the early 60's it is still unique in the world of architecture as there is no other building shaped like it. We were out in the city and looking to shoot some of the sculptures in parliament grounds when this vista presented itself. I shot it as an 'interesting' shot never intending it as a submission subject. When I got it onto the computer, it's symmetry and cleanliness just pinged. I worked in the building next door for two years and never saw the Beehive look as good as this. Post Processing:- Rotate .8 deg, +5 Brightness, +5 contrast, no cropping. Post Voting:- I'm quite surprised by the cropping comments. Because the building is completely symmetrical, I took the missing bits as visually implied and instead opted for a thirds treatment of the building in frame which allowed the sky and tree to provide some balance. I think in the end this is a more pleasing photograph for general purposes even though it perhaps suffered in "Shapes" because of it. In response to your request, here is your in depth critique from the Critique Club. The first thing I notice is the most commented on aspect here. The cropping. I would like to see all of this building, but I like the position of the building within the photo. I like having it off to the right of the photo, with space to the left, however, wish that the whole building was in the picture. Maybe if you just took the photo from the same spot, and just zoomed out a bit, or took a few steps backward if possible. That would help show all of the building, but also keep the composition as is. Focus is spot on. I love the detail you show us in the building, and the trees really add a little burst of contrast, which is really nice. The colors are nice, and that sky is just beautiful. The shape is definately in interesting one for the challenge. I certainly have never seen anything like it. Thanks also for the background/history of the building, interesting facts. Having been there, I think this is a great capture of where parliment sits in NZ ... nice shape. Great building with lots of potential for a great photo. Personally I think you have not made the most of this subject because it suffers from having its side and top cut off. Also the palms are very distracting, but I guess this might not be something you can get around. Perhaps moving around to another position? Good shot, and great building, but you should shoot something even more abstract for a higher score. Good angle and clarity. Could use maybe a little more contrast work? I'm not sure that cropping off the top was a good idea. Proudly hosted by Sargasso Networks. Current Server Time: 04/19/2019 08:17:58 AM EDT.